PAPILLION, Neb. – SpartanNash and its 14 Family Fare Supermarkets and three Supermercado Nuestra Familia stores in greater Omaha today donated 200 bags of groceries to the Open Door Mission. Each bag contained 17 Our Family® brand products to provide meals to local families in the fight against hunger in the community. The donation was the result of the “Pack the Pantry” fundraising event held at the SpartanNash retail stores between December 5 and 26, 2016. Associates from the Papillion, Neb. Family Fare joined (from left) Assistant Store Director Tanner Nielson, Open Door Mission Communications Coordinator Maggie Cope and SpartanNash Senior Director of Retail Operations Lonnie Eggers during the donation. 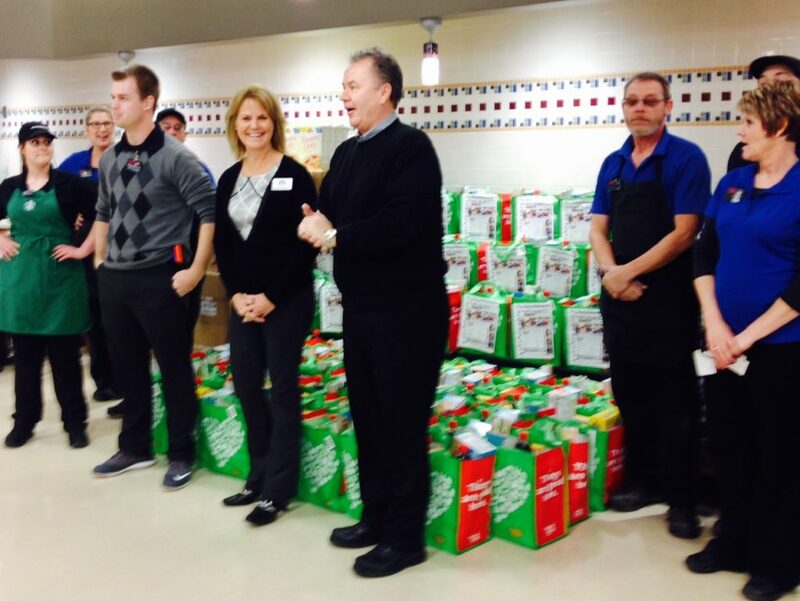 In total, store guests donated 170 bags of groceries to provide hunger relief and meals to families in their community. SpartanNash – which owns and operates the Family Fare and Supermercado stores – donated an additional 30 bags of groceries to benefit the Open Door Mission. “Hunger affects people from all walks of life,” said Candace Gregory, president and CEO of the Open Door Mission. “Many families are just one job loss or medical crisis away from food insecurity. In fact, 28 percent of children do not know where their next meal will come from in our local communities. The Open Door Mission is grateful to partners that invest in others like SpartanNash and its Family Fare and Supermercado stores. Every day, the Open Door Mission offers 816 safe shelter beds to the homeless, serves more than 2,300 nutritious meals to the hungry and provides homeless prevention resources to more than 275 working poor families to empower them to remain in their own homes.